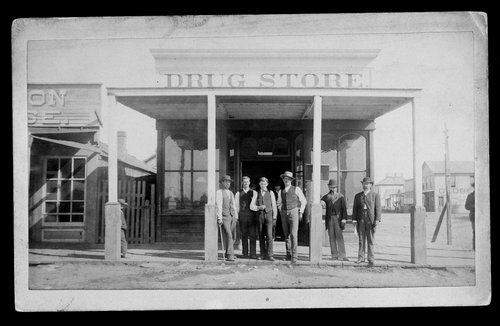 This photograph shows an exterior view of the Drug Store on the northwest corner of 2nd and Front Street in Dodge City, Kansas. Several men are seen posing for the photograph in front of the store, and a boy is partially visible behind the post on the left. The man on the right of the group is Dr. T. L. McCarty, identified as the first doctor in Dodge City.